With four kids at our house, school, church, playdates, and a lot of extracurricular activities, we are really busy. When my four year old was a toddler I made a list of 5 things that we would try to do every day together. Having a simple list helped us make sure to spend some quality time together each day. Toddlers are a lot more capable than babies so sometimes I have a hard time figuring out what to do when I find myself alone with my littlest (other than catching up on chores). Babies are a lot of fun and so adorable! 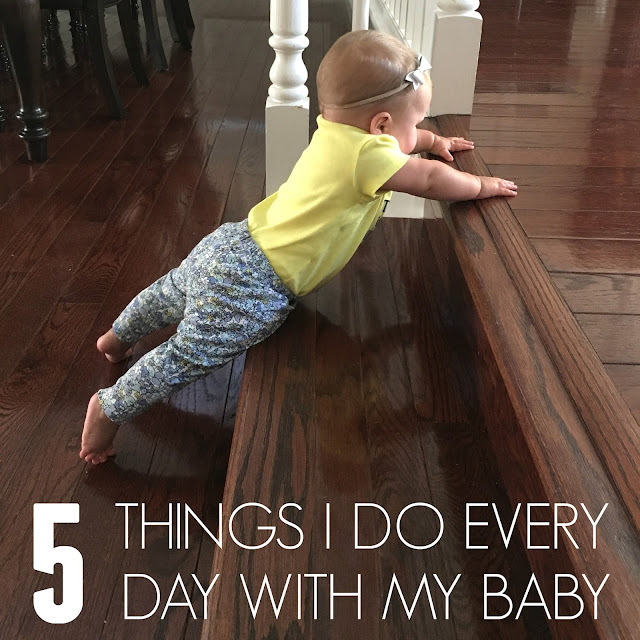 Recently I created a simple list of activities to try and do every day with my 9-month-old. The time is flying so quickly and I want to make sure that with the hustle and bustle of every day, I am still slowing down each day to have fun with my baby. Our simple daily activities are tied to what my littlest wants to do again and again, not what I want to do. It is fun to see how her interests change at each stage. I love turning on the radio on my phone and dancing around with my daughter. Her entire body gets into the beat and she will shake her legs and get really focused. Sometimes she likes to pull herself up using a chair and then bounce. Enjoying music together and watching her get really excited about the music is always a highlight of my day! With four kids, we are constantly doing laundry. My daughter loves to climb on laundry piles and she especially loves to help me as I load the washer and dry our clothes. Typically while I am loading the washer, she tries to take things out of it. Once we are done with the washer (and I've finally gotten everything back in it), we load the dryer. We have a front loading washer and dryer so once I start them, she just likes to stand and watch all of the clothes go around and around. It is fascinating to her and I love to watch her enthusiasm as the clothes hit the glass and the colors swish around. All of my kids were a bit obsessed with teeth brushing from an early age. When I brush my teeth with my electric toothbrush, my babies like to help hold on to the brush while I clean my teeth. They love the vibrations and the shape of the brush. We repeat this process at least twice a day. Now that my little daughter has SIX teeth, we've been checking out the Baby Orajel™Tooth and Gum Cleanser. All you do is apply a small amount of Baby Orajel™ Tooth and Gum Cleanser to the fingerbrush and gently brush your child's teeth and gums! The fingerbrush is perfect for little ones that are teething or cutting teeth because it is so gentle. I love that one of our daily "activities" involves starting good habits now. My daughter just thinks that brushing her teeth is fun right now! My daughter is obsessed with climbing. If we leave the baby gate open accidentally, she beelines straight to the stairs. Since she loves the stairs so much, we spend time every day climbing the stairs. I stay close by her while she is climbing and she goes up both flights of stairs and then wants to do it again and again! We are also working on teaching her to turn around and go backwards when she crawls down the stairs too. At her current stage, my daughter needs supervised playtime with her siblings. Her siblings are so fun to play with, but they aren't really capable of predicting problems or noticing choking hazards yet. Each day I work together with my big kids to find time for them to play with their little sister. Sometimes they blow bubbles, sometimes they read, and sometimes my older daughter will push the baby around in a giant box. Every day is different! My 9-month-old's face lights up when she sees her older siblings. Sibling playtime is the highlight of her day! 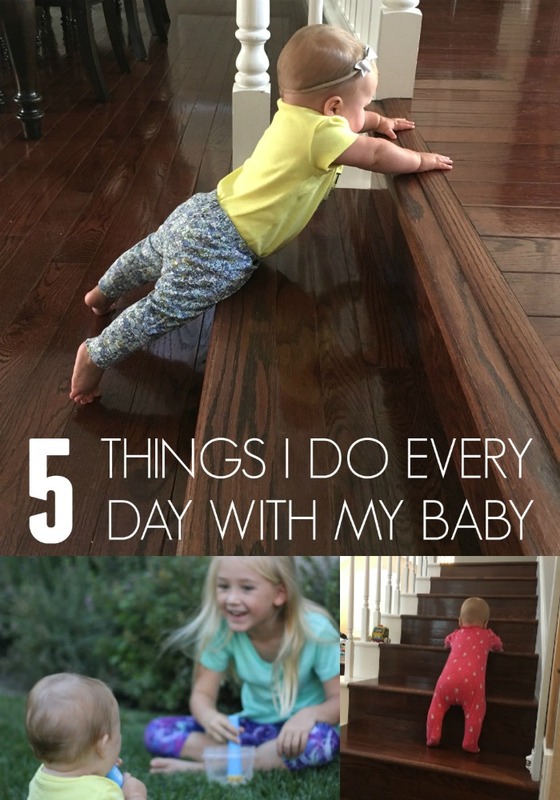 Do you do any of these simple 5 things with your baby? If not, what are your favorite activities to do together regularly? Here are some of our other favorite baby play activities. Does your baby like to get his teeth brushed? 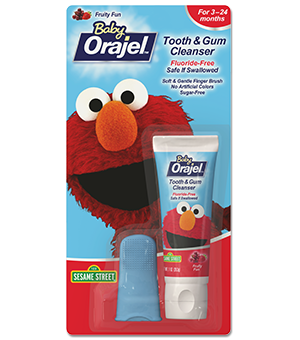 Have you tried Baby Orajel™Tooth and Gum Cleanser yet? I'd love to hear about you and your baby in the comments! My baby (12 months now) is also obsessed with brushing her teeth...I think just because she sees her 3 siblings doing it every day! I haven't seen that finger brush before...I totally want to try it!